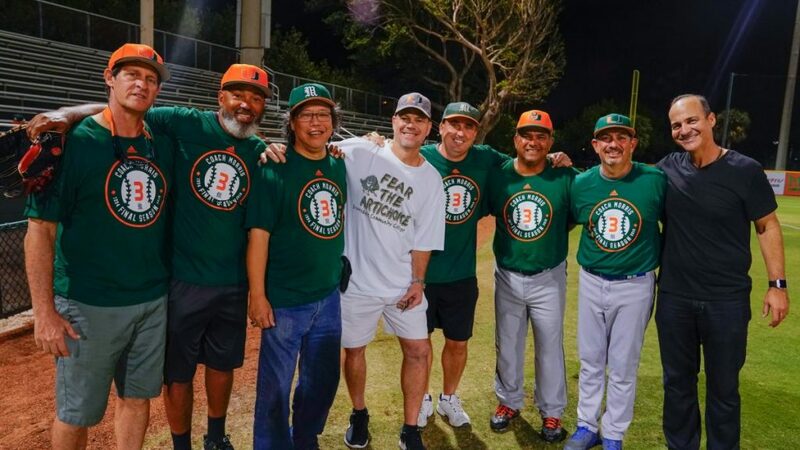 Miami Hurricanes fans got a taste of what the 2018 season has in store at the annual FanFest and Alumni Game Feb. 10 at Alex Rodriguez Park at Mark Light Field. In its final tuneup before the regular season, Miami’s pitching staff shutdown a lineup featuring minor leaguers and former 13-year MLB veteran Aubrey Huff, cruising to a 2-0 shutout victory. Sophomore right-handed pitcher Evan McKendry struck out five batters in five scoreless innings, silencing the likes of Hurricane greats: David Thompson, Carl Chester and Dale Carey, among others. Standout slugger Romy Gonzalez opened the scoring for Miami with an RBI-double in the first inning. Rookie speedster Tony Jenkins drove in the other run with an RBI-double in the fifth inning. Before the game, fans got the opportunity to meet the players and coaching staff, take pictures with the Miami Maniac mascot and grab a Mark Light milkshake – a local favorite. FanFest was also a chance for UM to honor 94 alumni, who were all recognized during pregame ceremonies. Larry Adams, the oldest alumnus present at age 90, played for the Hurricanes in 1948-49. For many families, FanFest has become an annual tradition. Diaz’s father, Sergio, talked about Jim Morris’ last Alumni Game as head coach of the Hurricanes. The event brought a record number of alumni back to Mark Light to honor Morris, who is entering his 25th and final season at Miami. 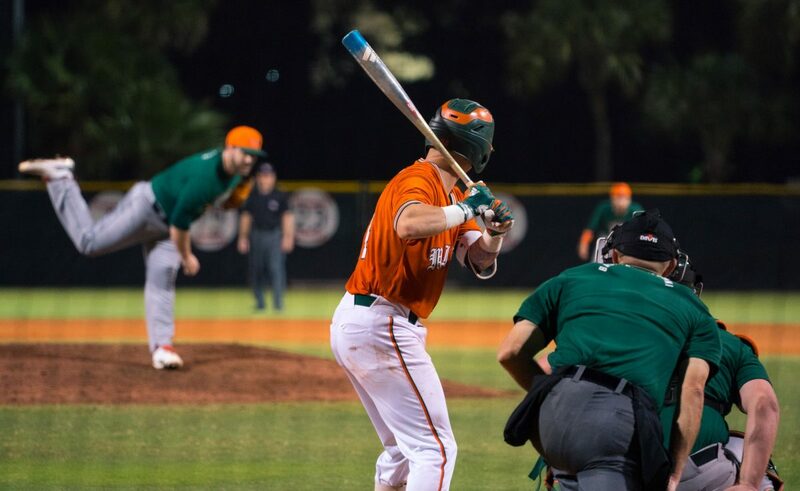 For many former Hurricanes, coming back to play one more time in an orange and green jersey was a one-of-a-kind experience. With the offseason in the books, fans are ready for a bounce-back 2018 campaign. Miami opens its season against Rutgers 7 p.m. Feb. 16 at Mark Light Field.